Whe n uploading a NEF RAW file the lens details are not displayed,instead there is a combination of letters and numbers and it says (unknown). Can you please attach the image so we can investigate this further? This is a clip showing the problem,as you can see this would normally show the lens type. Unlike the final version 1.6.5 that works correctly, I also have the problem with the beta 243 but the lack of data is mentioned in plain text! Strangely, I get the same hex string as you when exiftool is present in the beta "Resources" directory!? And there, aperture and shutter speed are correct. I still have had no response to my original post from Affinity,I have as you can see sent a copy of a photo for them to investigate.I thank you for looking into this for me,I will now try to find how to update the exiftool,I can see I have a version on my system. I find it rather strange nobody else has posted having the same problem. I'm not seeing those problems. Exiftool does launch with the current Beta. However I don't know why 2 of them. sorry, but I have two machines on which I installed the beta and neither came with exiftool ... I just put it on one of them to check this problem. Here are 2 clips one from the stable and on e from the beta,these are in resources.They both show the exifdata file,so why does the exiftool not open in the beta version? If you don't see it running when you use Task Manager, then something is wrong. You should see two copies running. 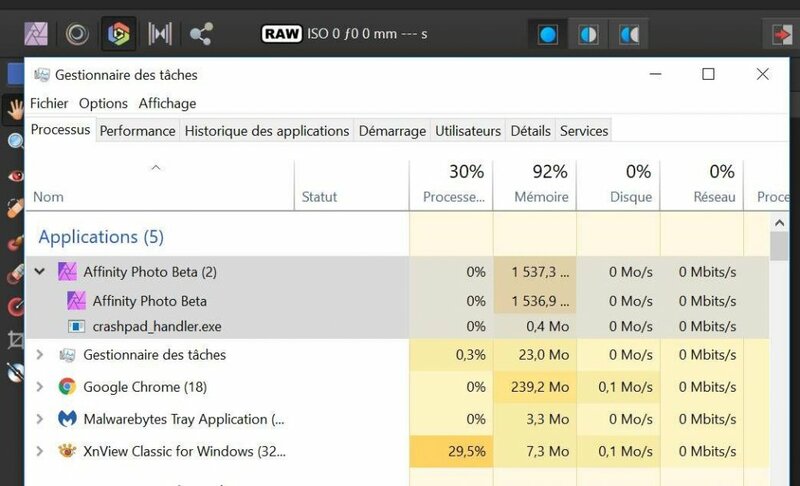 Hi Walt,that is the problem I do not see it running in Task Manager on the beta version,although it still has the exif data embedded when I open the exif drop down menu.However it does not show the lens on the top line. I have a feeling that we have already fixed this, but I need to check when I'm back in the office next week (I don't believe it's anything to do with exiftool, nor will it be solved by updating exiftool - I think...). I am sorry Mark but this has not been fixed,and I have the latest 251 update.I agree with you on the EXIFTOOL,however this does need updating it is quite a few behind.Looking forward to having this problem resolved,although to some it might seem minor. I think I understood the problem regarding the non-installation of exiftool by the beta ... This happens if we have manually updated exiftool. I just did the test with a clean install of the beta 243 on which I manually updated exiftool with the latest 11.29 version. I then updated with beta 251. In this case, the updating process removes everything but does not reinstall exiftool! It's reproducible. Hi @laurentia, yes, this is to be expected as it will only remove the files that we installed. 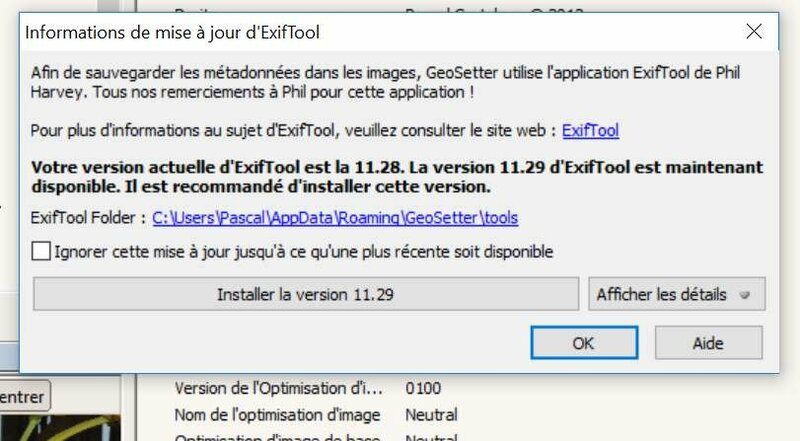 It knows that the updated exiftool was not installed by us, so it won't remove it. Sorry Mark, but we did not understand each other! Everything is removed, but the problem is that in this case and in this case only, exiftool is not reinstalled. This is a bug in the update process. -when it's finished, go back to the Resources folder of the new beta: exiftool is not there! As I said, it's reproductible. At this point you have modified the installation, this is not something we anticipate (nor have tested), and not anything that we would support. In the next release we will no longer ship exiftool, so this entire problem should go away. Thank you Laurentia,for your input to my problem,and also to Mark for clearing up the same.I use another library program so I have the EXIF data there to reference from.So now I do not have to rely on AP for this info in the future. You're welcome ! This is a problem that should affect some other users.